Spring is a time of transition in the Great North Woods... The geese return, sometimes to a little snow. Fisher folks get out looking for that first bite. The loons appear for a swim. And look for salt from the road. Phillips Brook and the rivers in the area roar with fury fueled by melting snow. On the 29th of April, the Pathways Pregnancy Care Center Had A Walk for Life. They proceeded about town, winding up at Centennial Park. Hams from around the area gathered for license testing at the Colonel Town Community Center in Lancaster. The 30th of April was a fun day in the wind with the Dalton Gang. They had a great chicken barbecue and a western style action shoot. Below are a few new folks checking out the particulars. Summer is coming! Click below to whet your appetite for summer rides! 1999 Blessing of the Bikes done! Click on the link or the picture to check it out and see why the folks below are smiling! Paul Doherty, author of "Smoke From A Thousand Campfires" is no longer with us. He passed on to the "happy hunting grounds" a few weeks ago. I greatly admire his writing and will miss him a great deal. I only had the benefit of talking with him on the phone a couple of times and had wanted to meet him. It's too late now. My priorities have now changed to meeting as many of the old fellows from the area I've wanted to meet for a long time before they are gone. As I get to it you'll find stories on this site about the area and the older folks who know the "real" Great North Woods. 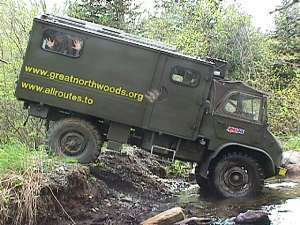 Now that we have our Unimog I can take them to places they have known in the past but couldn't get to in years. I asked George if he could go for a Mog ride that afternoon and he said he'd love to. A couple of weeks before while out for a ride with Chip Greive (A soon to be Mog owner) we had bumped into George in the middle of nowhere. He had remarked he would like to be able to see some of the places he hadn'e been able to get to in years due to the roads having fallen into direpair and being swallowed by the woods.